The last time we gave an update on our stats was about a month ago when I presented dogetipbot in the Startup Showcase at CoinSummit. 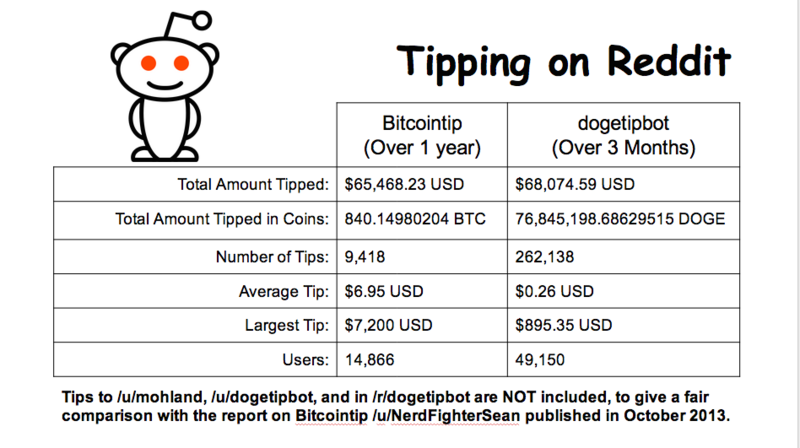 At the time, we wanted to compare dogetipbot against the big name in the cryptocurrency tipping space — /u/bitcointip. The results… really surprised us. Since then, /u/bitcointip announced they’re shutting down their service on Reddit and passing the torch to ChangeTip. dogetipbot’s still going strong and not slowing down. With that said, here’s our latest stats to set the bar a bit higher. $1619.21 USD in dogecoin tips expired or declined (returned to sender). Oh, did I mention these stats are just from Reddit and we’ve only been around for 4 months? We’ll be rolling out dogetipbot on other services here very soon. We’re also 100% free (no fees, ever) and we pay for all Dogecoin transaction fees. So… why aren’t you using dogetipbot yet? 🙂 Join us over on Reddit! Impressive. If there are no fee’s, how do you make a wage. It can’t be from tips, there wouldn’t be enough. Just curious as I wonder in awe how everything works and how people can devote their time (full time) . I wish I could do alt coins full time. All the best & thanks for a top tipbot. Ranger. Fees wouldn’t be enough to cover a wage, so we decided it’s best to keep fees out of this. I love this bot, very helpful! Here, have some dogecoins! Any hope we can ever have a dogetipbot API to see what transactions are going on? I’d love to integrate it a pet project of mine. Are there plans to merge with @tipdoge? I think that would be a good move.